WOW! Very cheap flights to Hawaii: Honolulu for only €561! After yesterday’s crazy hit to Philippines we have another awesome deal for all fans of RushFlights! 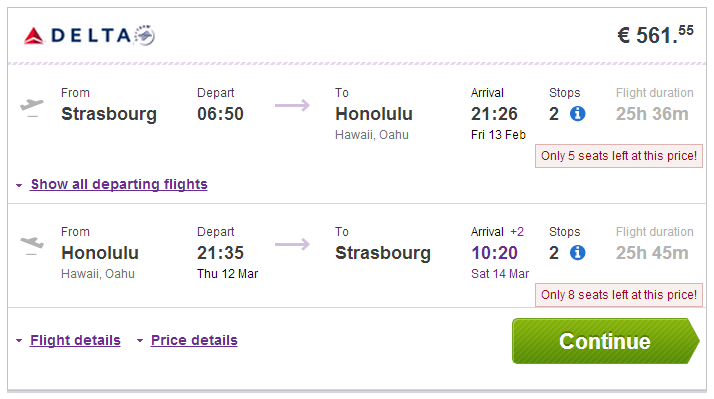 Return tickets from Strasbourg to Honolulu in Hawaii are now available for only €561! Regular price of tickets to Hawaii from Europe is €1000+! You can fly also to Kahului (OGG) instead of Honolulu. Strasbourg is located right on the border of Germany and France. 23 kg luggage is included, flight is operated by Delta, KLM and Air France. Travel dates are very limited in February and March. Book fast through Vayama to get this awesome price! Accommodation in Hawaii can be pretty expensive so we recommend to carefully compare more hotels and bookings sites. It’s a good idea to look for a cheaper places also directly after your arrival, private accommodation can save you lot of money. Use our search engine to check the accommodation options of all budgets. There is plenty of beautiful places which can be visited only by car and it also gives you much better flexibility, because the public transport isn’t very good. Renting a car is the best option to travel around so check the rates to get the best prices. « Cheap last minute flights to Mexico: Cancun for €379!